I mentioned in 2014 that I'll do food post from time to time. Well, the time has come and here is the first (and I hope not the only) food blog post, focused on Easter. 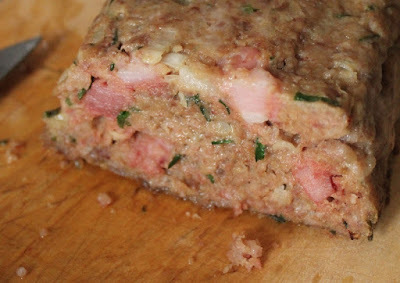 I have three recipes for you this time - mazanec, Easter stuffing (nádivka) and egg spread. I love it. Mazanec and vánočka have the same batter so once you master it, you can bake Czech specialities both for Easter and Christmas. Ingredients bellow are for two baps (loafs). First of all you need yeast starter - warm up half cup of milk (should be warm, not hot), add two tea spoons of granulated sugar and dry yeast. Let it rise for about 20 minutes. When the dough is ready, let it rise for one and half hour in flour-sprinkled bowl. After that 1,5 hour divide the dough into two pieces and form loaves. Place them on baking tin and let them rise for another half an hour. Preheat the oven to 350°F (180°C), smear the loaves with mixed (creamed) eggs and bake it for 20 minutes. Then lower the temperature to 280°F (140°C) and bake for another abt 15 minutes. Check if mazanec is ready by sticking a skewer into the loaf - if it is dry, mazanec is ready. Chop the smoked meat and rolls/bread to 1x1 cm pieces. Preheat the oven to 350°F (180°C). Dip the rolls/bread pieces in milk, mix the eggs and butter with nettles, onion, parsley and chives, add the meat and rolls/bread, add salt and pepper. Stir well and pour into square form sprinkled with oil or fat. Let bake for abt 30 to 35 minutes. There usually is one large problem after the Easter Monday in CZ: what to do with all those hard-boiled eggs you have? One of the possible ways how to solve this problem is egg spread. And what about your families? Do you have some Easter specialities? The Easter stuffing looks delicious!! I will have to try it!! Thank you so much Blanka! The oldest log house in Bohemia? In Rtyně!